This pudding really has the wow factor but is low effort and best of all, no bake! Mix together the crushed biscuits and melted butter. Mix together the cream cheese and icing sugar. Place the topping mixture onto the chilled bases and return to the fridge for another few hours. Below is a video of me baking the no bake irish cream and malteser cheesecake to show you that it really is that easy! If you like baking, you may like to check out my blackberry and apple crumble cupcake recipe or easy chocolate fudge. There is a slow cooker version of the fudge too. Oh my goodness Louise, how amazing does this look?? I’m popping over to yours for coffee next time you make it! Louise this looks amazing!! Doubt it will fit into my New Years healthy eating but it’s my birthday at the beginning of February so maybe I can whip it up as a little treat? I would bathe in this! Errrrm, WANT WANT WANT!!!!!!!!! I absolutely love a Baileys cheesescake, and I’m not usually big on desserts-but if there’s one of those bad boys going, I just can’t resist! 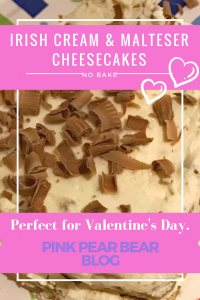 And no bake will always be a massive winner! I’m def taking a night off from lentils and chia seeds for this!! Thanks for being the co-hostess with the mostess!! Oh wow, that looks amazing! I could just eat that right now! Luscious and I was trying to avoid this post but then you linked it up so I just had to look! Looks yummy. Not sure the maltesers would make it into the recipe though as I seem to inhale them the minute the packet is opened! Oh wowser! This looks amazing! Oh that’s lovely!! I’d really like that! This sounds so delicious! It’s calorie free too right? This looks so tasty! Also not too complicated to make. Fab!